Members of the Defence Forces 44th Infantry Group train in Wicklow earlier this year, ahead of their deployment. DEFENCE MINISTER SIMON Coveney has said Irish troops in the Golan Heights are being dragged into a “very nasty civil war” and that as far as he’s concerned, what’s been happening in the region does not represent “an acceptable level of risk”. 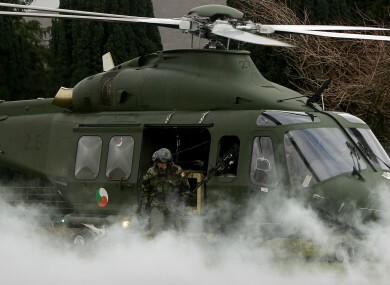 Speaking this morning, Coveney reiterated his call for a UN review of the mission, and said that would need to happen before the Defence Forces’ next scheduled rotation of troops, due to happen in the next four weeks. Irish soldiers were involved in a daring mission to rescue their UNDOF colleagues from the Philippines in the Golan Heights at the weekend, after the Filipino troops came under attack from Syrian rebels. All 75 of the Filipino troops caught up the siege were confirmed as safe yesterday. The rebels, some of whom have links Al-Qaeda, surrounded them and demanded their weapons last Thursday. The fate of more than 40 UN peacekeepers from Fiji still remains unknown, however. The Fijians were taken captive by rebels just before the Filipinos were besieged. The troops are serving as part of the United Nations Disengagement Observer Force, set up in 1974 to police a ceasefire between Israeli and Syrian troops in the area. Speaking to RTÉ’s Morning Ireland, Coveney said it was ”clearly no longer a demilitarised zone”. “I’ve made it very clear that I’m not going to commit Irish troops to this mission unless there’s a very fundamental review of how it’s going to operate,” he said. “We need to get assurances from the UN and where possible from Israel and Syria that where possible we can operate to the mandate of this mission,” he said. An ‘on the ground’ review of operations is already under way, but the Minister said he wanted a broader review to be carried out at United Nations headquarters in New York to decide whether the mission should continue in its current form. What has happened on the ground in the last three days is not an acceptable level of risk from my perspective, and I suspect the Government’s perspective either. Regarding the imminent rotation of troops, he said, “clearly we will need to have a review before then, before we make those decisions”. In the meantime, all UN troops in the mission will be working hard to secure the release of the Fijian soldiers, Coveney said. Email “"Not an acceptable level of risk": UN mission review needs to happen now, says Coveney”. Feedback on “"Not an acceptable level of risk": UN mission review needs to happen now, says Coveney”.